One of the strongest influences on modern sportswear is 1920's fashion. Styles first introduced in the 20s can still be seen on the runway today. The Roaring Twenties were a time of newfound affluence, post-war optimism and increased freedom due to the proliferation of the automobile. As society shifted, so did clothing. Women in particular were experiencing a greater sense of independence in the early part of the century. On August 18, 1920 the 19th amendment to the United States Constitution was ratified, giving people the right to vote regardless of gender. As new opportunities became available, women seemed to shed the constricting fashions of the previous century. Camisoles replaced corsets and waistlines became looser and less rigid. Women adopted a long, straight silhouette in their skirts and dresses. In 1923, Mary Pickens Brook of the Woman's Institute revolutionized style when she developed the one-hour dress. Thanks to Brook, women could make their own dresses in very little time by following a simple Butterick sewing pattern. This easy style, coupled with the increase in mass manufacturing, made fashion accessible to women of all income levels. Further democratizing style was the trend towards natural fabrics like wool and cotton. Silk was still popular for evening, but played a lesser role than in previous years. Also popular for evening were shorter hemlines. The flapper style, which is what many people think of when they think of 1920's fashion, was actually only popular for about three years in the later part of the century. Flappers were independent women who smoked long cigarettes, wore makeup and danced the Charleston. This modern dance craze was best done with exposed knees. Therefore, flapper dresses featured above the knee hemlines. Other characteristics were straight, sleek shapes and dropped waists. The dresses were often embellished with jewels and beading. 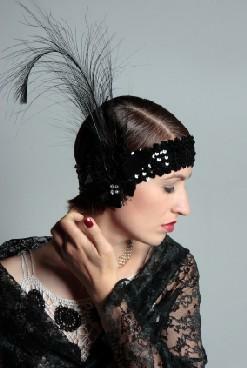 To complement the flapper look, women began to adopt a short, sleek hairstyle called the bob. The bob was created in Paris in the early 1920s and made famous in the United States by silent film actress Louise Brooks. The cloche hat became popular because it worked well on short, straight hairstyles like the bob. Cloche hats were bell shaped hats, usually made of felt that fit close to the head. Often photographed wearing a cloche over her sleek bob was Paris fashion designer Coco Chanel. Chanel epitomized 1920's fashion. Her clothes were more casual than the styles from the previous century and they reflected a sporty, independent sensibility. Women were taking up sports like tennis and golf and exercising in an attempt to achieve the boyish figures that had become popular. Chanel's collection included pleated tennis style skirts and loose cardigans in place of more formal jackets. Chanel favored neutral colors like navy, beige and black and she used soft, fluid fabrics for her designs. One of the designer's greatest contributions to fashion was thelittle black dress (LBD). Chanel envisioned the dress as a woman's uniform. It was simple and stylish, a perfect example of form following function. Vogue magazine called the dress a Ford, in reference to the ubiquitous Model T. With the popularity of the LBD, black became a go-to color for a woman's wardrobe when previously it had been reserved for mourning and other somber affairs. Just as she changed the role of black in fashion, Chanel also changed the way women wore jewelry. The designer enjoyed mixing fine jewelry with costume pieces. Her penchant for draping multiple ropes of faux pearls and gold chains made costume pieces more acceptable and allowed women with smaller budgets to adopt stylish looks. The influence of 1920's fashion can be found in today's modern styles. For starters, women can find the same looks in high-end boutiques as they can in discount retailers. Costume jewelry copies the look of fine jewelry. Many statement necklaces popular today are based on the bold styles worn by Coco Chanel. Clothing designs are stitched by hand, produced in rich fabrics, and then copied by mass producers in less expensive fabrics. Cardigan jackets and sweater dressing, first worn in the 1920s, have become staples in modern sportswear. Even the bob has become a classic hairstyle seen recently on celebrities Katie Holmes and Victoria Beckham. Thanks to 1920's fashion, comfort and style are not mutually exclusive.